Well, this fair didn’t have birds and bees so much as the many offspring of overactive rabbits. Along with chickens, horses, cows, pigs, and goats. We watched several young ladies show all of these animals in a round-robin showmanship contest that lasted four hours. We didn’t stay for the whole thing, but hats off to the girls for their stamina. 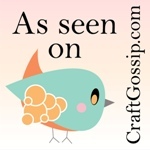 For me the highlights were the craft exhibits, especially of the needlework and quilting. 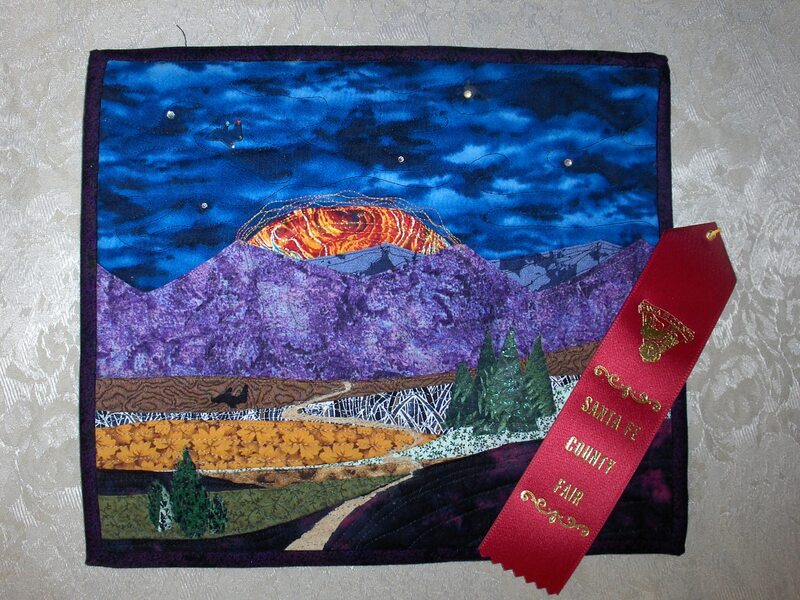 Santa Fe County has many talented folk, and I enjoyed looking at all the beautiful lace, crocheting, and quilting, as well as the gorgeous photography and too-bad-they-were-in-a-glass-case baked goods. Yummy. Okay, so the real highlight was seeing the first place ribbon on my tatted Rose Garden doily. 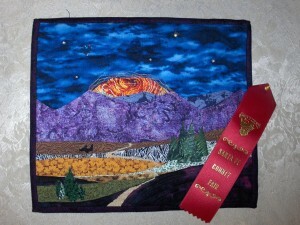 Also I loved the second place ribbon on my landscape quilt, especially since I didn’t expect it to win anything. 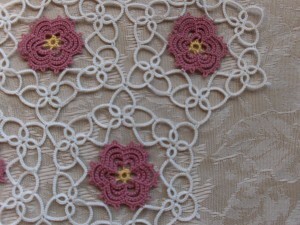 My Rose Garden doily is made of size 10 DMC threads, in white, mauve taupe and yellow, and measures 41 cm (16″) across. 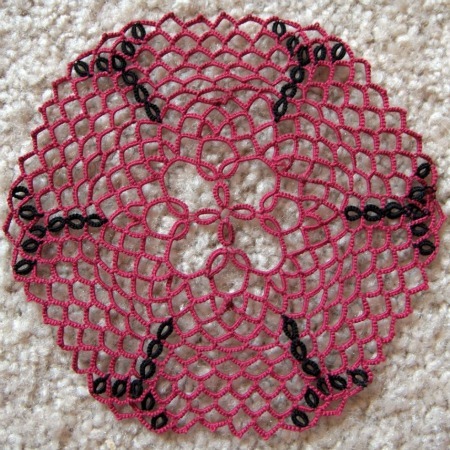 The pattern is by Darlene Polachic, from her “Big Book of Tatting.” I somewhat modified the stitch count in the rose centers so that they would lay flat more easily. I’ve been working on this doily on-and-off for three years, and finished it up only a few months ago. I received good comments from the judge, receiving 42 out of 44 points. 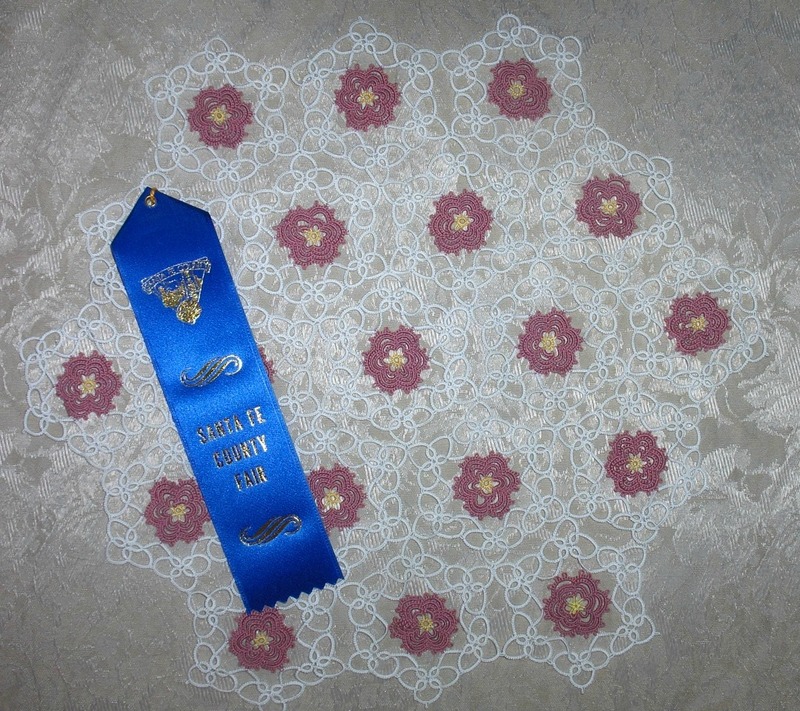 I was slightly surprised that our small county fair not only had a tatting category, but an entire judging sheet designed for tatting–though it looks like a modified version of the crocheting score sheet. Next month I’ll be driving to Albuquerque to enter the New Mexico State Fair. I’m still deciding what to enter, and fortunately have a few options to choose from. 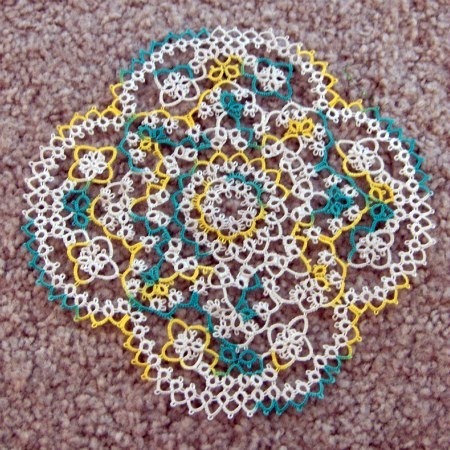 Your rose doily is gorgeous! 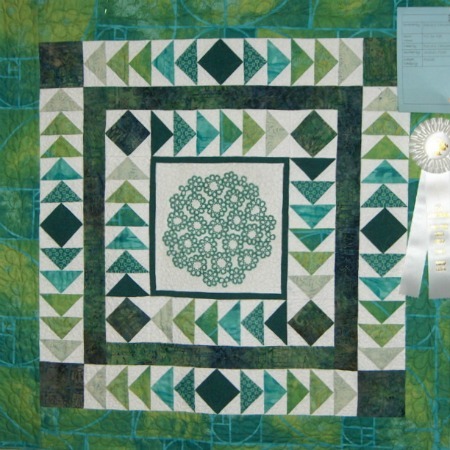 Congratulations on your blue ribbon – and good luck at the state fair! Cindy, thank you. I put a lot of time and effort into that Rose Garden, and am very happy with the way it turned out. I adore this incredible site. The pictures are absolutely awesome. As a baby photographer myself I appreciate vision when I see it. Thanks for sharing. I certainly knew about nearly all of this, but never the less, I still believed it had been valuable. Sweet work! Sharolyn, Vielen Dank für Ihre Kommentare. Sie können mir in Deutsch schreiben, wenn Sie wollen. Ich brauche Praxis. Wow! Beautiful rose doily. Congratulations! Bin ich vom Teufel getrieben? Ich hoffe nicht.